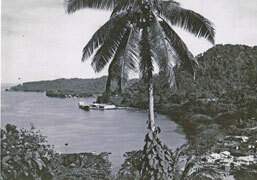 Fr Kevin Kerley’s work of identifying and cataloguing of historical hand-written concerning the Bougainville crisis continues in improved surroundings. 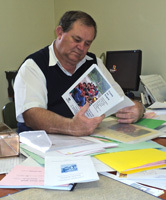 In his new office at Villa Maria Monastery, Hunters Hill, NSW, Fr Kevin has expanded filing and map-reading facilities where he carries on working on the records he compiled during dangerous days in the North Solomons in the late 1990s. 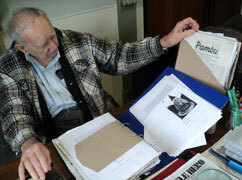 Fr Kevin preparing material for microfilming by PAMBU. One of his hand drawn maps of Bougainville village areas. 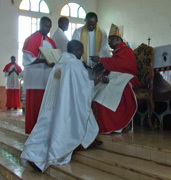 Newly-ordained African Marist, Fr Christian Abongbung, is well-connected with Marists of the Asia-Pacific region. 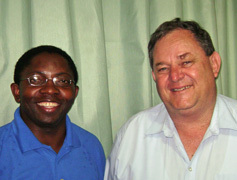 As a boy Christian was encouraged in his vocation by Fr Bob Barber, at that time a missionary working in the Marist Mission District of Africa and now vicar-provincial of the Australian province. Fr Christian made his novitiate at Tutu, Taveuni, Fiji, and pursued seminary studies at Marist College, Suva, Fiji, with pastoral experience in New Caledonia. Ordained recently his home parish of Bambili, Cameroun, he is the youngest member (33) of the African Marist Mission District. Christian Abongbung and Fr Bob Barber in Sydney, 2010. 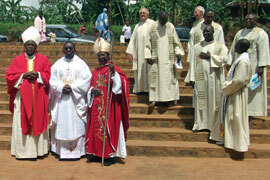 Ordination on May 14 by Most Rev Cornelius Esua, Archbishop of Bamenda. Also present was lifelong friend, Bishop Emmanuel Bushu (“a friend when I was still a kid serving him as altar boy”, says Fr Christian) and other Marist and local priests. On a Sydney stopover en route from Brazil to Suva Oceania provincial, Fr Ben McKenna, gave positive feedback on the first-ever international gathering of Marist vocation directors. 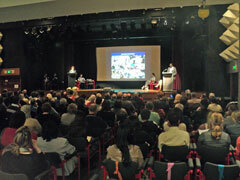 "It was a very constructive four days at Curatiba." he said, "We shared the reality of the provinces and mission districts in which we work and looked for practical ways of working together to foster Marist vocations. We made seven recommendations which will be announced soon." Fr Ben has recently taken over the Oceania provincial's job from Bishop-elect, Paul Donoghue, who is currently making a pre-ordination retreat at 'Maryvale', Hunters Hill. Seventeen vocations promoters from provinces and mission districts all over the Marist world have begun their meeting at the "Centro Mission Marcellin Champagnat" in Curatiba, Brazil. Australians, Frs Bob Barber and Ben McKenna are among them. "We have begun with reports and will soon have an analysis of the information collected during these presentations. It's a complex situation because there are very different cultures in the Society of Mary. We want to get a good picture of the current reality on Marist vocations, and then find ways of collaborating among geographic areas and at the general level. " Other goals of the meeting include planning for a Year of Prayer for Marist Vocations, participation in World Youth Day, establishing a forum on vocations, networking of local vocations personnel and an international vocations web site. 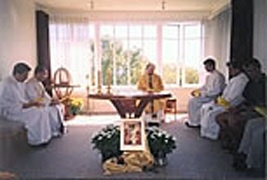 Marist vocation promoters in session / ...and gathered for the Eucharist. The four-day meeting finishes on May 20. 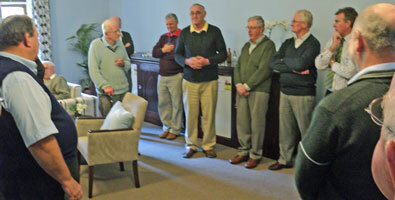 'Maryvale', Hunters Hill, NSW, was the setting for twenty Marist Fathers, (including a number from the 'Montbel' retirement community), to 'bone up' on forthcoming changes to the Roman Missal. Burnie, Tas, parish priest, Fr Tony Kennedy SM, led a briefing session on May 18 on significant revisions to the English liturgy to be implemented throughout Australia this year. From Jun 12 the new spoken texts may be used, whilst Nov 01 will see all revised Mass texts become official in every diocese. 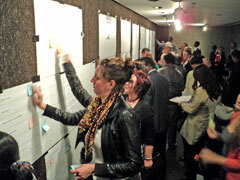 / participants practise the people's responses using 'pewcards'. From left: Frs Kevin Bates (JPICC and councillor), Ron Nissen (JPICC), Tony Kennedy (councillor) , Kevin Stewart (JPICC), Jim Carty (JPICC), Ray Chapman (councillor) and Paul Cooney (provincial). Not present: Frs Bob Barber (vicar provincial) and Paul Mahony (JPICC). The Australian province's Justice, Peace and Integrity of Creation Committee has met with the Provincial Council at its May meeting. "bringing together diverse community organisations, unions and religious groiups to advance the common good and achieve a fair, just and sustainable city." 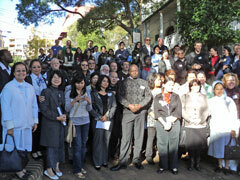 Hunters Hill-Woolwich parish priest, Fr Kevin Bates, and Fr Ron Nissen (with the Australian Myanmar Catholic Community) were present with several lay Marists at the discernment assembly at Surry Hills, NSW, on May 15. Both are members of the Australian province Social Justice group. 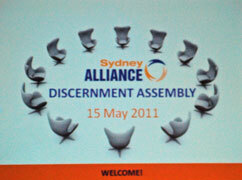 On Sep 15 at Sydney Town Hall an expected two thousand people will launch the Sydney Alliance in the presence of legislators and civic leaders of NSW. Marists in the Asia-Pacific region conclude their novena of prayer for vocations on May 15. Daily reflections from Pope Benedict's message for World Day of Prayer for Vocations were used throughout the nine days from May 06. 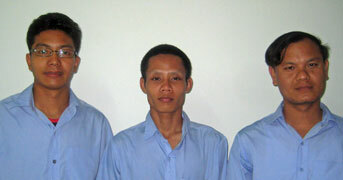 Thailand: Pioneer group of aspirants (from Chin and Karen states, Myanmar), Marist Mission, Ranong. 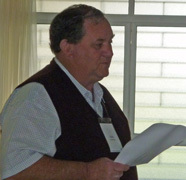 Representing the Australian Marist province at an international vocations gathering in Curatiba, Brazil, is Fr Bob Barber SM, vicar-provincial and vocations coordinator. 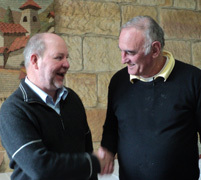 Leaving Sydney on May 12 Fr Bob joins Marists from all over the globe to plan an International Year of Prayer for Vocations as well as sharing promotional resources and planning for wider collaboration in vocations ministry. 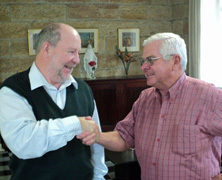 Fr Bob is pictured (left) preparing Australian vocation material for the Curatiba meeting. He will take copies of the Saturday prayer for vocations -- in twenty-three languages. 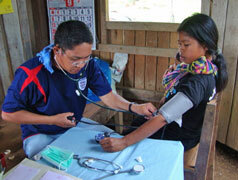 Marking forty years of priesthood is Brisbane-born, Fr John Hopkinson SM, Marist missionary from Bolivia, who returned to Australia on May 10 for jubilee celebrations and health checks. Fr John ('Hoppy' to his friends) has worked for thirty-three years in Central and South America and is one of the region's leading authorities and teachers on 'Basic Ecclesial Communities'. Welcome back, Hoppy! by Marist provincial, Fr Paul Cooney. Journeying to a mountain village on Palm Sunday last. Australian Marists mourn the passing on May 06 of Mrs Valerie Burton, With her husband, John, Val was a pioneer volunteer of the Marist Mission Centre working regularly at the Hunters Hill office for almost forty years. 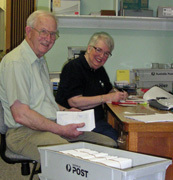 Val's cheerful, helpful and caring presence at MMC will be long remembered not only by Mission Centre staff but Marists from near and far, including hundreds of missionaries from Asia and the Pacific. We offer John our deepest sympathy with the promise of grateful prayers for Val. 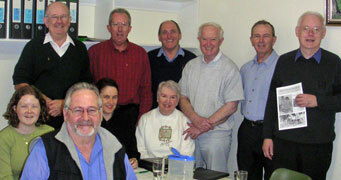 Valerie and John Burton were foundation members of the Marist Mission Centre Development Committee (Val in white). The newly-appointed bishop of Rarotonga (Cook Islands), Fr Paul Donoghue SM, has visited Sydney to assist with planning of the Marist Asia-Pacific ongoing formation program. A gathering of over thirty local Marists welcomed Fr Paul at a celebratory luncheon at Villa Maria monastery, Hunters Hill. Fr Paul, until Apr 29 the provincial of the Oceania Marist Province, has been a key figure in promoting the 'Spirituality and Lifestyle' program. The first of several 10-week segments will begin in October of this year. The episcopal ordination of Fr Paul will take place at Rarotonga on Jul 16. Retiring bishop, Stuart O'Connell SM, will preside. Bishop-elect Paul with Marist confreres at Villa Maria monastery; with Frs Paul Cooney and Paul Sullivan. One hundred years ago (Jul 12, 1911) Lionel Marsden was born in Bundarra, NSW; seventy years ago he was ordained a Marist priest (Nov 30, 1940); forty years ago (May 05, 1971), he died. Fr Marsden (he was 'Sam' to his friends) is known as the founder of the Marist mission in Nara Prefecture, Japan. 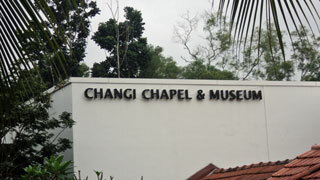 Months after ordination he was appointed as AIF chaplain in Malaya then underwent gruelling wartime experiences. After the fall of Singapore and work on the notorious Thai-Burma railway he witnessed sickness, starvation, torture and summary execution on the railway and at the Changi POW camp. 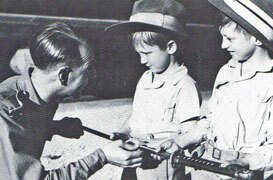 'If I ever get out of here alive,' he told himself, 'I will go to Japan as a missionary.' And he did. Nara today boasts eight Marist-founded churches, five kindergartens, a day nursery, two aged care homes, plus a toy library for handicapped children and a club for the parents of disabled children. 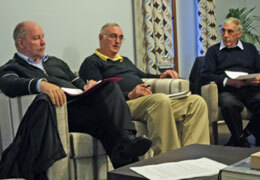 Six Marist Fathers continue Fr Marsden's work in Japan. 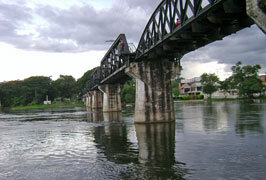 Memories of Fr Lionel Marsden: River Kwai bridge / War cemetery, Kanchanaburi, Thailand; Lists if prisoners / chaplains at Changi prison, Singapore; Changi memorial today / reconstruction of the Changi chapel. 2011's novena of prayer for vocations to St Peter Chanel has again been prepared by New Zealand vocations promoter, Fr Pat Brophy. This year's cover page features Australian artist, John Coburn's, image of the saint which is now hanging at 'Montbel' retirement centre, Hunters Hill, NSW. Formerly the painting hung in the chapel of St Peter Chanel's scholasticate, Toongabbie (now Campion College). The novena is usually prayed in the nine days leading up to St Peter Chanel's feast, Apr 28. However, to avoid the days of Easter during that period, Fr Pat suggests we use it from May 06-14 as a prelude to Vocation Sunday, May 15. Click here for the novena.